Six years after Cole Berringer goes west to build a new life, he writes to his childhood sweetheart, Sarah Main, and proposes marriage. But instead of the woman he left behind, her twin sister, Elizabeth, arrives in Colorado to take her place. Elizabeth Main has loved Cole for years, but has always known she isnâ€™t the woman he loves, so when her twin refuses his marriage proposal, she grabs at the chance to make her dreams come true. As the weeks go by, Cole and Elizabeth grow closer, and Elizabeth is convinced itâ€™s only a matter of time until Cole returns her love. Â Â Â Â Elizabeth Mainâ€™s heartbeat stuttered as the postmaster handed the battered envelope to her twin sister, Sarah. It had been six long years, but Elizabeth recognized the barely legible handwriting immediately. Â Â Â Â Cole. Cole Berringerâ€™s scrawl. Â Â Â Â Elizabeth closed the door against the perfumed breeze from the honeysuckle arbor in the yard and the rattle of carriages passing on the cobblestone street outside. Her skirts swished on the polished wood floor as she followed on Sarahâ€™s heels through the foyer. Â Â Â Â Sarah crossed to her fatherâ€™s study and retrieved an engraved silver letter opener from his desk, then strolled into the drawing room and sat daintily on a brocade chair beside the fireplace. Â Â Â Â Elizabeth followed close behind, barely able to contain herself. Sheâ€™d waited for this letter since the day heâ€™d ridden away to fight in the war so long ago. Â Â Â Â Elizabeth bristled. She remembered the day Cole and Quinn had given her the nickname, and it had stuck until Cole left for the war and his brother had followed shortly after. Â Â Â Â Elizabeth met Sarahâ€™s blue-eyed gaze and smiled. Sheâ€™d never been able to stay angry with her twin for more than a minute or two. And she was much more interested in what Cole had written than she was in continuing her pique. Â Â Â Â While Elizabeth paced the room, Sarah opened the envelope, then withdrew three pieces of paper and began to read. Â Â Â Â Elizabeth had been heartbroken when Cole hadnâ€™t come home after the war. A neighbor whoâ€™d returned a few months after the war ended had told her heâ€™d gone to Colorado, but no one had heard anything about him since. Â Â Â Â Elizabeth couldnâ€™t even imagine so much space. Why, the ranch was likely larger than Summerton, the small town outside Philadelphia where she and Sarah had grown up. Â Â Â Â â€œWhat else?â€ Elizabeth prodded. Â Â Â Â â€œHe wants me to come to Colorado. He wants me to marry him. Look.â€ She held up a fistful of ten-dollar bills. Â Â Â Â The silence in the room was punctuated by the hourly chime of the grandfather clock in the corner. Elizabethâ€™s throat grew so tight she feared sheâ€™d soon be unable to breathe. Â Â Â Â Sarah smoothed the crumpled pages and folded them neatly, then slipped them back into the envelope. Before she had a chance to respond, the door burst open and an elderly woman rushed in. â€œWho was at the door?â€ she asked, fanning herself furiously against the July heat. Â Â Â Â â€œThe postman brought a letter from Cole, Aunt Meg,â€ Elizabeth told her. Â Â Â Â The disdain in her auntâ€™s voice surprised Elizabeth. What did she have against Cole? Â Â Â Â â€œHeâ€™s doing very well financially,â€ Sarah put in. Â Â Â Â â€œIâ€™m sure heâ€™s grown up by now,â€ Elizabeth interrupted. â€œIt was a long time ago.â€ And not entirely his fault, she could have added, but decided sometimes silence really was golden. Â Â Â Â â€œHmmph. Nevertheless, you canâ€™t make a silk purse from a sowâ€™s ear.â€ Her aunt had a proverb for every situation, and Elizabeth couldnâ€™t remember ever getting through a conversation without hearing at least one. â€œHas anyone ever tried?â€ Elizabeth asked innocently. Â Â Â Â â€œMaybe Sarah could turn Cole into a silk purse.â€ Elizabeth couldnâ€™t imagine Cole being any different from how she remembered him – tall, strong, with eyes the color of slate and a tiny dimple in his chin that sheâ€™d teased him about for years. No, she couldnâ€™t picture him as a refined town gentleman, sipping tea with the ladies or dressed in a frock coat and derby. Â Â Â Â Elizabeth was tempted to point out to her aunt that it was â€˜ruffiansâ€™ like Cole, men who craved adventure and who were willing to risk their lives to explore new frontiers, who had discovered America in the first place. â€œI think he was very braveâ€”â€ she began. Â Â Â Â Elizabeth suspected this was part of the reason sheâ€™d fallen in love with Cole so long ago. Sheâ€™d known it the first time sheâ€™d seen him that he was the only man sheâ€™d ever love. Of course, heâ€™d been little more than a boy then, poised beside the Ring-the-Bell, his shirt sleeves rolled up, his sinewy forearms gripping the mallet, and a cocky grin on his face. In one smooth effortless arc, heâ€™d swung the mallet. Sheâ€™d watched as it had hammered the board at the bottom, sending a piece of metal flying up a tower. A moment later, the bell had rung. Right then, sheâ€™d fallen in love, and even though her heart had been shattered when heâ€™d begun courting Sarah, her love for him had grown stronger with every passing day. Â Â Â Â And then heâ€™d left Summerton. Gone to fight for the Union Army. Sheâ€™d prayed every night for his safe return, and even though he hadnâ€™t come home when the fighting was over, at least heâ€™d been alive. Â Â Â Â Elizabeth could have given a two-hour lecture on Colorado. Sheâ€™d read everything available on western travel and settlement, as well as the tales in the dime novels she hid beneath her mattress. Â Â Â Â Elizabeth heard the sigh of relief escaping from her lips and guiltily slid a glance to her sister and aunt. Had they heard her? Â Â Â Â â€œEighty-seven, eighty-eight â€¦â€ Elizabeth stifled a yawn as she sat at her dressing table later that night and ran the mother-of-pearl hairbrush through her long blonde hair. Â Â Â Â Suddenly, the door burst open. Sarah hurried in and let out a distressed sigh as she flopped down on the bed, her frilly chemise and pantaloons flapping. Â Â Â Â â€œThat was unfortunate for him, but providential for you,â€ Sara put in. Â Â Â Â â€œIt was, and since then, Aunt Meg has allowed me time to recover from my broken heart.â€ Elizabeth began to laugh, and within seconds, she and Sarah were lost in fit of giggles. Â Â Â Â Elizabethâ€™s throat tightened. Surely Sarah wasnâ€™t serious. Sheâ€™d made it very clear earlier that sheâ€™d rather wither away as a spinster than live in the Colorado wilderness. Â Â Â Â â€œBut even marriage to that fuddy-duddy couldnâ€™t convince me to go to Colorado. 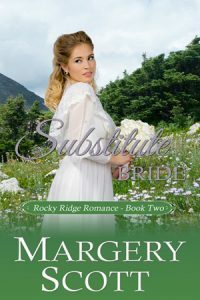 Cole has been out in the sun too long if he thinks Iâ€™d ever consider his proposal,â€ Sarah said, running her braid through her fingers. Â Â Â Â Yes, Elizabeth thought, her mind wandering. Sheâ€™d imagined just that for years. Well, not the ranch part, but she had fantasized about being married to Cole and living with him in Colorado every night after she said her prayers. Â Â Â Â â€œIâ€™m going to bed,â€ she announced, slamming the brush on the silver tray on the dressing table. Â Â Â Â Bounding up, she crossed the room, slipped out of her silk wrapper and draped it across the foot of the bed. Sliding under the sheets, she turned her back on her sister lest she see in her eyes the longing for something sheâ€™d never have. â€œPlease turn down the lamp before you leave,â€ she muttered as she pulled the blanket over her shoulders and closed her eyes. Â Â Â Â Hours later, Elizabethâ€™s eyes sprang open. The house was silent, the fire had died, and faint moonlight filtered through the curtains at the window. Â Â Â Â An idea had germinated somewhere in her subconscious as she slept. She and Sarah were twins. Theyâ€™d spent many hours giggling about how theyâ€™d fooled not only their parents, but the servants, their tutors, their friends. Â Â Â Â Why not Cole? Could she fool him, too? Her heart skittered inside her chest. It was a dangerous plan, one that could ruin her reputation and leave her homeless. Yet, excitement gnawed at her at the thought of becoming Coleâ€™s wife. Sarah didnâ€™t love Cole, so Elizabethâ€™s actions wouldnâ€™t hurt her. Sarah would never leave Summerton. So why couldnâ€™t she take Sarahâ€™s place and make her own dreams come true? Â Â Â Â There was no doubt in her mind that what she was considering was wrong. Yet if it made Cole happy to think she was the woman he loved, and she was married to the man sheâ€™d dreamed of for years, how could it really hurt anyone? Â Â Â Â Sheâ€™d loved Cole since the day sheâ€™d discovered the difference between boys and girls, and her prayers that heâ€™d somehow discover he loved her, too, had gone unanswered. Now, this opportunity had presented itself, an opportunity to make her dreams come true. Â Â Â Â Yes, it was deceitful, and she was sure her plan was a sin, but the temptation was too strong to resist. Â Â Â Â She would go to Colorado. She would become Sarah. And she would marry the man sheâ€™d always loved.